A toothless Mansfield Town were well beaten as they crashed 3-0 away to relegation rivals Oxford United at the Kassam Stadium this afternoon. Trailing 1-0 to an Alex MacDonald goal at the break after a scrappy first half, there was at least hope of Stags stepping up a gear after the break. Instead the visitors barely left their half and home keeper Ryan Clarke had the easiest of afternoons. Indeed, his only real save was a poor Oliver shot that spun up off a divot en route in the first half. 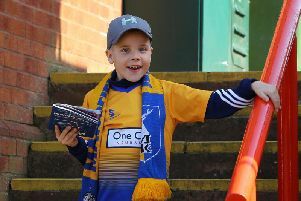 Otherwise Mansfield created very little and got what they deserved on the day as another MacDonald goal and a Danny Hylton penalty sealed three vital points for Oxford on a poor surface. The win saw Oxford leapfrog Mansfield in the relegation scrap as they chalked up an identical score to last season in this fixture. Mansfield gave a debut to loanee Brighton & Hove Albion winger Jeffrey Monakana. The former Arsenal trainee has joined the club for an initial month. He came in for the injured Reggie Lambe, who limped off with a hamstring problem in Tuesday night’s sparkling 1-0 win over Luton Town. It was the only change as Adam Murray kept faith with the players who served him so well for a second game against one of his former clubs in five days. Monakana occasionally showed glimpses of his pace and strength, but he couldn’t open up Oxford and the supply to him was abysmal in the second half as he remained a spectator for much of it. In the second minute Tafazolli and Oliver both headed on a long throw from Elder from the left, but the ball sailed across the edge of the six yard box with no one able to capitalise. Monakana’s first run down the right was halted by the challenge of Wright. On four minutes the home side won the game’s first corner. Taken by O’Dowda from the right, it reached Long at the near post who was afforded a chance to turn it home, but slotted wide. Monakana went on a promising burst into the box but sliced a poor finish wide. Oliver almost grabbed a goal out of nothing on six minutes when his scuffed shot seemed to hit a divot and had Clarke in all kinds of trouble as he half-stopped it and watched it bounce dangerously near goal. A MacDonald cross clipped Ravenhill which almost made it creep under the bar, Pidgeley tipping over for a corner, from which Hylton headed wide. Thomas was well wide with a hurried shot from 20 yards as we entered the 17th minute. A minute later Baldock left Elder on the floor as he got past him and sent in a dangerous cross that Hoban headed wide. Ex-Stag Mullins got in the way of a Heslop drive, then Thomas made it three yellow cards in as many starts with a foul on Wright on 20 minutes. Monakana went on an exciting run on 29 minutes, almost setting up Oliver until Mullins came in with the challenge. However, it was United who drew first blood on 31 minutes. Baldock crossed from the right and Pidgeley came for it but failed to get there as the ball bounced invitingly for MacDonald to lash home from seven yards into an empty net. MacDonald then sent over another ball from the right which saw Hoban get up well but his header lacked enough power to trouble Pidgeley. Heslop almost levelled two minutes from the break as a half-clearance reached him 20 yards out and his volley took a deflection inches wide with Clarke helpless. In stoppage time Oliver headed away a Collins free kick and then blocked Ruffels’ follow-up as Stags went in 1-0 down with work to do. Stags were worried about Thomas getting a second yellow card and also the lack of support up front for Oliver. So for the second half Thomas was replaced by Bingham, who went up front in a 4-4-2. Two minutes in, a MacDonald cross took a deflection and Hoban planted a firm header just wide. On 50 minutes MacDonald tried a low shot from 25 yards which zipped across the surface and Pidgeley turned wide for a corner. A challenge between Hylton and Riley left Riley on the ground and players pushing and shoving, Hylton eventually booked. MacDonald then doubled his and Oxford’s tally with goal number two on 54 minutes. Tafazolli’s superb tackle prevented Hylton getting his shot away. The ball ran to O’Dowda who beat a defender and fired at goal where Pidgeley saved, but the ball then reached MacDonald who drilled an unstoppable finish inside the left post. Tafazolli slid into a tackle on Hoban on 58 minutes. He won the ball well but the referee decided the tackle was dangerous and produced a yellow card. Oxford attacked down the left and Long’s cross was put wide by Hylton. We had reached the hour mark and Stags had barely left their own half since the break. On 63 minutes it was game, set and match to Oxford as they bagged a third goal. Tafazolli brought down Hoban in the box and there were no complaints as the referee pointed to the spot. Hylton stepped up to send Pidgeley the wrong way with the coolest of finishes. Kee replaced Oliver in the Mansfield attack on 72 minutes and three minutes later Lambe took from Brown. Hylton was lucky not to get a red card as he intercepted a Riley backheader towards Pidgeley with his hand and tried to finish. Pidgeley was then lucky as his kick hit Roberts and bounced back past his goal. Roberts also blazed a far post volley well over in United’s next attack. Stags fans just wanted to hear the final whistle, but the officials tortured them with an additional six minutes. But there was no way Stags were going to score if he had added six hours on an afternoon to forget for the visitors. OXFORD: Clarke, Mullins, Wright, Hoban, Hylton (Roberts 75), MacDonald (Roofe 71), Baldock, Ruffels, O’Dowda, Collins (Whing 88), Long. Subs not used: Rose, Ashdown, Rasulo, Dunkley. STAGS: Pidgeley; Sutton, Riley, Tafazolli, Elder; Ravenhill, Thomas (Bingham HT), Heslop; Monakana, Oliver (Kee 72), Brown (Lambe 75). Subs not used: Studer, Rhead, McGuire, Beevers. REFEREE: Andy Woolmer of Northamptonshire. CHAD STAGS MAN OF THE MATCH: Ryan Tafazolli.